Riding these two bikes took me back to the simpler time of my early college days. Armed with a fresh driving/riding licence, I had a head full of motorcycling dreams and absolutely no cash to turn them into reality. Like every other 19-year old. I knew I'd have to turn to dear old daddy to get me my first set of wheels. Being the responsible kid I still am, I set out to find the perfect compromise between price and excitement, to keep both me and my father happy. Sadly, nine years ago there wasn't much of a choice and while I was convinced the freshly launched Yamaha R15 was perfect for me, my old man thought that my mother's Honda Dio would get the job done just fine. No prizes for guessing for what my transport was for the next three years. But I digress. The reason these bikes gave me deja vu was that they were exactly what I was craving for back in the day. A healthy 20 plus horsepower packed in an involving chassis and all for around `1 lakh. 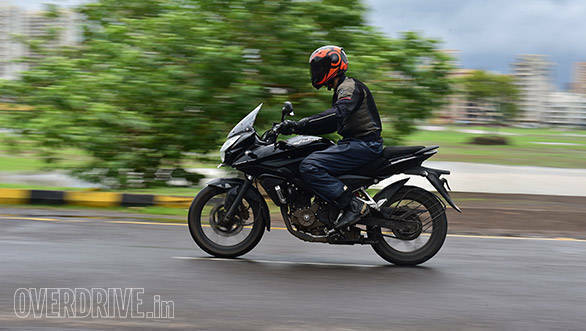 So far, the Bajaj Pulsar AS 200 (earlier the NS 200) had a great spec sheet to complement its sub-`1 lakh price tag and was king of the affordable roost. 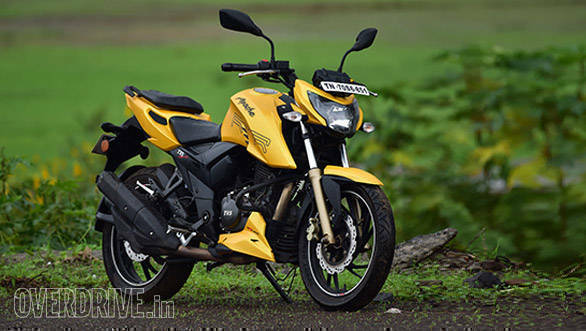 TVS aims to show Bajaj how it's done with the RTR 200, a bike that loses the spec sheet battle against the Pulsar but proves to be a very special little thing to ride. Let's start with the first thing a college student looks out for  looks! Both are handsome machines with great street presence but take a different approach. The RTR looks scalpel sharp, a ripped Bruce Lee compared with the more butch and larger looking AS 200. When you excuse the misleading Adventure Sport moniker, it's easy to appreciate the Pulsar's handsome quarter fairing and the wind protection it brings. Both bikes run monoshock rear suspension and have clean rear ends, but the RTR's looks more lithe and the fat rear rubber completes the look. To my eyes, the RTR is the sharper, more handsome bike, but you couldn't go wrong with either in terms of design. Where the RTR scores massively is in fit and finish, overall material quality and the way it is put together. Our complaints from the AS 200 first ride of poor fit and finish, uneven panel gaps and numerous rattles continue. This AS 200 is brand-new bike and has only done a gentle 600km, but the body work is already buzzing in areas. It really makes you question the longevity of the bike, and I'm cringing at the thought of having to live with all those creaks and rattles. The TVS' switchgear is also much nicer to look at and use, especially the indicator button since there's almost no physical sensation on the Pulsar to let you know that the indicator has been engaged. 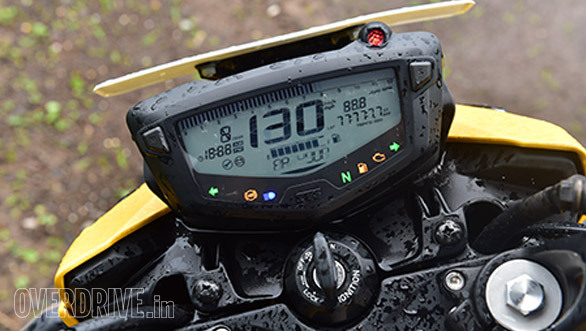 The Pulsar's clocks are easier to read, but I prefer the RTR's more modern looking, all-digital dash that offers everything including a lap timer and top-speed recorder. The Pulsar fights back with its very projector headlamp, a valuable feature that offers great visibility at night. 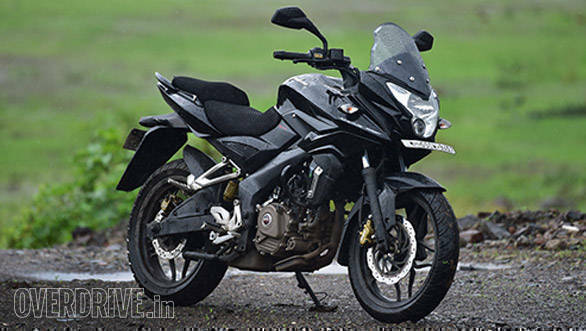 Based on the KTM 200 Duke, the Pulsar engine with its many spark plugs continues to be a treat. It sounds a little rough and thrashy at low revs but is, in fact, quite smooth and rev happy. 23.5PS is a healthy figure and coupled with a 6-speed gearbox, the AS 200 has an undoubtedly stronger top end than the RTR. 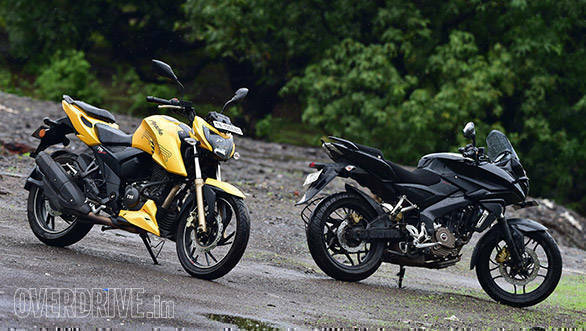 We recorded a top speed of 127kmph and 122kmph on the Pulsar and TVS respectively, but both have a little more to offer. While the Pulsar offers strong but linear performance, the 21PS RTR feels much smoother and has a stronger mid range. 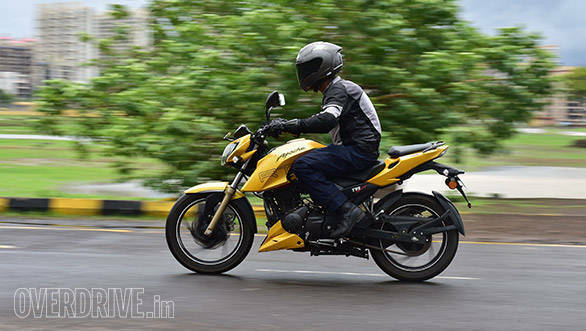 The TVS launches off the line faster and the punchy engine is a joy to use in traffic. The 5-speed box has closer ratios first to fourth and a tall fifth gear. The ratios feel shorter than the Pulsar, which makes for a more involving ride but this comes with the sacrifice of top-end performance. I wonder how much nicer this bike would have been with a 6-speed gearbox. 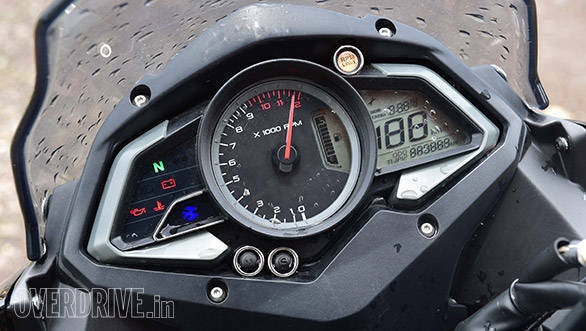 The RTR is only 0.35s slower to the Pulsar to 100kmph, taking 12.25s but returns a more efficient 38.4kmpl. Like its predecessor, the TVS makes an enjoyably fruity exhaust note. Running the same pressed steel frame and near identical suspension set-up to the NS 200, the AS 200 is a good handler. The bike offers great straight-line stability, better than the TVS, and this sense of confidence extends to the corners where the bike feels predictable and planted. The weak link here are the Eurogrip tyres that get the job done but feel inadequate when pushing hard. A few months ago, the RTR impressed us massively on the racetrack where it was just 0.6s slower than the Pulsar RS 200 that makes nearly 25PS. Around the same track or a mountain road, I'm quite sure the TVS will not only be quicker but more engaging than the AS 200. Despite a soft set-up aimed for street comfort, the RTR has a delicious nimbleness to it and a puppy-like eagerness to attack corners. The bike we're running has the optional (add about Rs 5,000) Pirelli Sport Demon front and Angel GT rear. They offer excellent grip, even in the wet, but there is an ever-so-slight mismatch in grip levels between front and rear at high corner speeds. We did get to sample the TVS Remora tyres that come as standard on the first ride and even those prove to be impressively grippy. More importantly, Ashok tells me that they're considerably nicer than the Pulsar's Eurogrips. 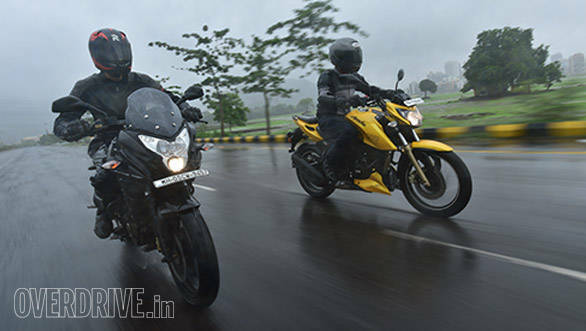 The Pulsar sports a more comfortable, upright riding position but has firmer suspension than the RTR. Make no mistake, the Bajaj's ride quality is quite good, but the TVS absorbs bumps better. Matching the RTR's involving dynamics is a more sporty riding position that places your legs higher up and generates a slight crouch to the clip-on bars. It's a more focused riding position that I enjoy, yet find comfortable despite my 6ft-1inch frame. 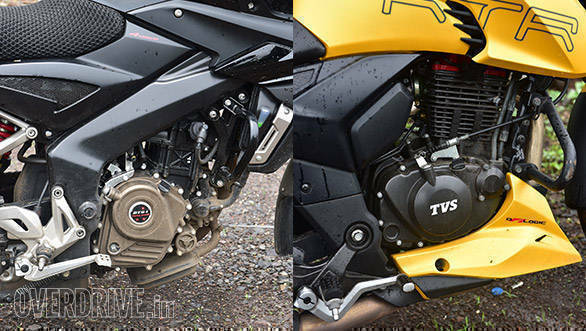 Both have strong braking performance with good initial bite and progressive feel, but we have noticed that the TVS tends to get increased lever travel after a while of continuous hard braking. Then again, the RTR offers better front-end confidence under braking, thanks to the superior tyres. After a thorough study of the brochures and spec sheets, imaginary 18-year-old me would have probably dragged my father straight to the Bajaj showroom. The reality, however, is a little different. After spending considerable time with both bikes, it's the TVS I'm more enamoured with, primarily for how much more involving a ride she is. It's a classic case of the faster bike not necessarily being the more fun one to ride. This is all very nice, but it would have been quite a task to convince my father that this is worth spending Rs 13,000 more for the RTR. To make matters worse, the fuel-injected RTR is not yet available in most cities with a waiting period of another two to three months. If the Pulsar was better put-together, this would not even be a question worth considering and the Bajaj would have won, thanks to its fantastic value. We know from experience that the NS, AS and RS series of Pulsars all have rattly plastics which increase the sense of the motorcycle's age as time passes by. This is not something the customer can fix, but the manufacturer can and we're surprised Bajaj hasn't done so yet. 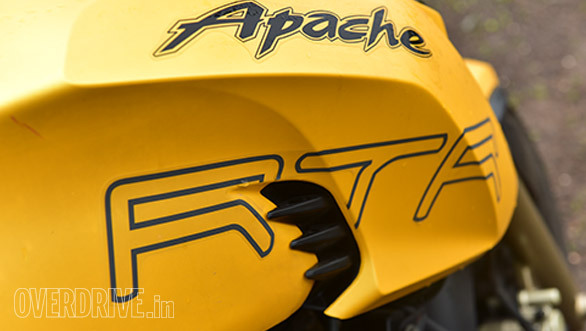 Alternately, another option comes in the Rs 90,000 (ex-Delhi) carbureted RTR. It ships with Pirellis and is just 0.95PS less. However, Shumi who's ridden both carb and EFI RTRs back to back on the first ride says there is a significant difference in throttle response. This manifests itself most at high speeds where the carb bike tends to struggle to match its electronically fuelled sibling. 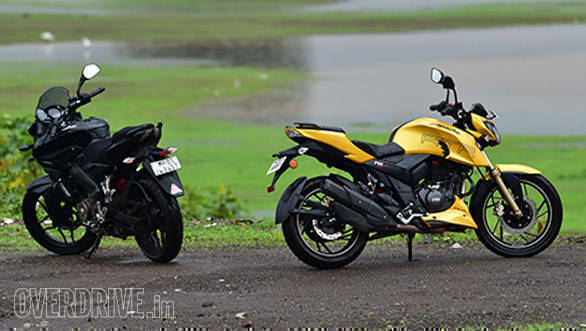 Back to the EFI, granted, the price difference to the Pulsar is quite large, and the Bajaj does have the slight edge in performance and touring ability. However, the RTR responds with a more cheeky and involving nature, better efficiency, nearly as good performance and significantly better quality. To me, this is enough to pay the extra few EMIs for the RTR over the Pulsar.